Since introducing the refreshed face of the 2019 Chevrolet Camaro, we have received an array of messages asking about the range-topping ZL1, which will retain the front end design of the 2018 models while sharing the new rear end with the rest of the lineup. Last week, General Motors rolled out the refreshed 2019 Chevrolet Camaro. We talked about how the LS, LT and SS have unique front end designs and how they all get a new rear end with round taillights, but we didn’t talk much about the ZL1. GM’s announcement didn’t include any pictures of the 2019 ZL1, but it did briefly address the restyling of the LT4-powered package and after receiving so many questions based on last week’s news – we wanted to focus on the highest performance Camaro. The most significant aspect of the 2019 Chevrolet Camaro refresh is the face, which has been changed quite a bit compared to the 2018 models. The headlights, grille and lower fascia have all been reshaped for 2019, with the SS getting a more aggressive design than the LS and LT models. 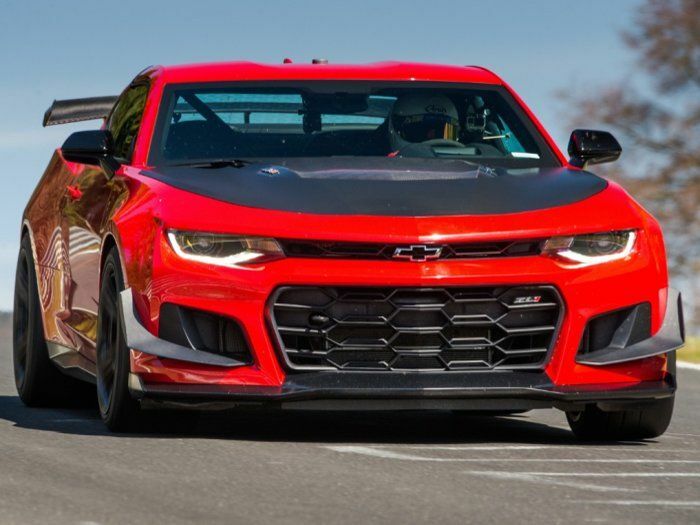 On the other hand, the 2019 Camaro ZL1 (and ZL1 1LE) will retain the same front end as 2018 models, as the current front end offers better air flow to the supercharged LT4 V8. Out back, the 2019 Camaro departs from the narrow, angular tail light lenses for a pair of oval lenses on each side of the re-sculpted rear fascia. All models, including the ZL1, will get the new rear end design, but the ZL1 package will join the SS in sporting dark-tinted taillight lenses. Finally, the 2019 Camaro ZL1 will benefit from interior improvements along with the rest of the lineup, including the newest version of Chevrolet’s premium infotainment system and the rear camera mirror system from the Cadillac brand. While this might seem like an odd move to some people – keeping the “old look” on the premium performance model while introducing an all-new look for the rest of the lineup – it has become more common in recent years. When the 5th generation Camaro was refreshed for the 2014 model year, the ZL1 continued on through 2015 with the same front end as the earlier models. Over at Ford, the 2018 Mustang in EcoBoost and GT trim have received an extensive facelift, but the Shelby GT350 models have the same front end that they have worn for the past two years. So, while we might see a refreshed ZL1 in the next couple of years, the highest performance Camaro will wear the styling of the 2016-2018 models in 2019 while the LS, LT and SS models all come with the new exterior design. They did the same thing with the 5th gen because the ZL1 has a supercharger and requires crazy amounts of cooling.